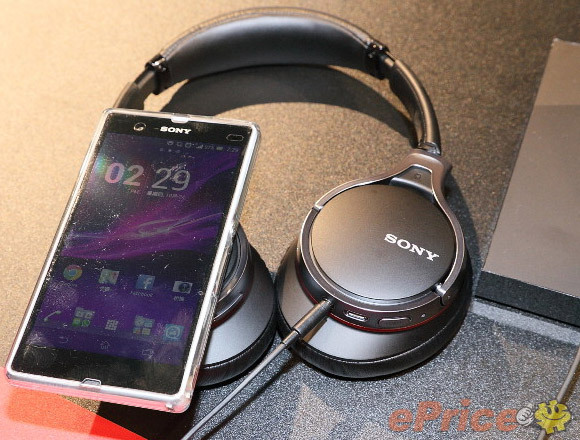 At an exhibition of Sony headphones an interesting, unidentified phone appeared – could it be the Sony Xperia Z1S? If you've missed the rumors, the Z1S is supposed to be the international version of the Xperia Z1 f (also called Z1 mini sometimes). UPDATE: ePrice posted a clarification that the device in the photo is actually an Xperia Z, not the Z1S. The Sony Xperia Z1 f is the first true super mini – it has the same specs as its 5" counterpart (Xperia Z1), but has a 4.3" 720p screen and a more compact body. It sports a Snapdragon 800 chipset, a 20.7MP camera and is water-resistant. Unfortunately, it's exclusive to NTT DoCoMo in Japan. The device in the photo looks similar to the leaked render of the Xperia Z1S, except for an element below the screen (it looks similar to the mouthpiece of the Xperia Z). The device is relatively small too, judging by the headphones. The Sony Xperia Z1S should be unveiled on November 12 at an event in Shanghai according to rumors. alongside It we should see an affordable 6" phablet powered by an octa-core MediaTek chipset. With the holidays approaching fast, we're likely to see a quick launch of both of these devices.